Rio-born poet Vinícius de Moraes wrote the lyrics for Jobim's melody (the original Portuguese version had been recorded by Brazilian singer Pery Ribeiro in 1962) and the English translation was supplied by reliable American songsmith Norman Gimbel. With the exception of Astrud, everyone involved with the G/G project (and the earlier Jazz Samba with guitarist Byrd, which had topped the album chart just a couple of weeks before the session) had been plying their trade for many years. As a teenager, Byrd had jammed with guitar legend Django Reinhardt while stationed in France, serving with the U.S. Army near the start of World War II. He preferred the nylon string guitar and studied in Italy with Andres Segovia in the mid-'50s. By the time bossa nova became the rage in the early '60s he was on the roster of the Riverside label and followed "Desafinado" with the successful early '63 solo hit "Meditation (Meditacao)." Later in the decade he moved to Columbia Records. João Gilberto hailed from the Brazilian state of Bahia and established himself in 1949 at age 18 as a singer on radio stations in Salvador with original songs like "Bim-Bom." His vocal sound was always soft and whispery; it's doubtful he realized how influential this style of singing would be. He began making records in 1958, just in time to be a major player in the bossa nova movement, for the Odeon label in Rio de Janeiro. In 1961 he met Charlie Byrd during a tour of South America and this led to an association with Stan Getz. When it came to the saxophone, Stanley Gayetski was a natural, though he excelled at other instruments including clarinet, piano, harmonica and bass. His father gave him an alto sax in 1940 when he was 13; within a year he was playing at parties and dances and bought himself a tenor sax. By age 16 he had shortened his name to Stan Getz and was gigging with trombonist Jack Teagarden's band, which led to legal complications due to his age. Another complication: he began drinking and using drugs, habits that escalated as time went by. After joining Stan Kenton's band, Getz played on the session for "And Her Tears Flowed Like Wine," a top ten hit in 1944 (one of Kenton's biggest hits) that featured vocalist Anita O'Day. While still in his teens, Stan performed with superstar bandleaders Jimmy Dorsey and Benny Goodman. He began leading his own band and appeared on the Savoy label in the late 1940s, taking advantage of an opportunity to perform with sax legend Charlie Parker. Stan stayed busy for years, performing with many of the great bands and as a solo act. His work was released on the Prestige, Royal Roost and Clef labels; even an overdose in 1954 and jail time related to his drug use barely slowed him down. He was clean for a time and had joined Byrd for a series of club dates just as the bossa nova was taking hold. Jazz Samba on the Verve label was an inspired pairing of the virtuoso duo; arguably the hottest act on the early '63 music scene, they received a Grammy nomination for Album of the Year and another for Record of the Year for "Desafinado" while winning for the song in the category Best Jazz Performance by a Soloist or Small Group, Instrumental. Another album by Getz (Big Band Bossa Nova) was a top seller at the time. 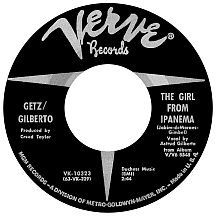 With all the sales action, Verve decided to hold back the release of Getz/Gilberto. A year later it hit the stores while "The Girl From Ipanema" (its setting: the beach in Rio) was issued on a 45 that edited out all but a couple of opening bars of João's humming while highlighting the vocal performance by Astrud (maiden name: Astrud Evangelina Weinert). She'd had little interest in becoming a singer but went with the flow despite her husband's objections and launched a career for herself in the process. In July 1964 the single hit the top ten, then the album went on to surpass the sales levels of the smash Jazz Samba (although it peaked at number two, unable to dislodge A Hard Day's Night by The Beatles, the hottest act of '64 or pretty much any year). At the April '65 Grammy ceremony, the unexpected happened: "The Girl From Ipanema" won Record of the Year, Getz/Gilberto won Album of the Year (a first for jazz in both categories) and the Gilberto couple (would we call them Jostrud today? Or Astão?) received separate nominations in the categories Best Vocal Performance, Male and Female. Getz won again in a similarly-worded category to the one he'd been victorious in the previous year. Astrud and Stan appeared in the film Get Yourself a College Girl with a slightly altered (no João) version of "The Girl From Ipanema," well on its way to becoming a pop culture standard. 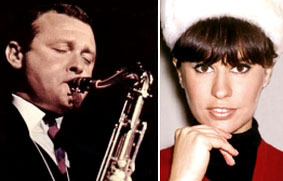 A live track, "The Telephone Song," was done with the same basic crew as the award-winning album; the single was credited to Stan Getz/Astrud Gilberto. She recorded for Verve as a solo act for the next five years and received another Best Vocal Performance, Female Grammy nom for '65's The Astrud Gilberto Album. He was with Verve until the early '70s, then spent the remainder of the decade on Columbia. Plagued with health issues during the 1980s due to prolonged drug and alcohol abuse, Stan Getz died in 1991 at the age of 64, leaving us with a sizeable collection of top-notch jazz recordings spanning over four decades in addition to priceless memories for those fortunate enough to see and hear him perform.